Want to be notified of new releases in vogelino/visual-interfaces-basics? A review and report of my works within the course Visual interfaces basics supervised by Prof. Constanze Langer @FH-Potsdam in the winter semester 2015/1. By Lucas Vogel. The course Visual interfaces basics is an introduction to the fundamentals of interface- and screen- design. It offers a theoretical, reflectional and practical approach the digital screen world, although most investigated concepts are equally relevant in most derivations of Design. A personal approach to the interface's improvement. 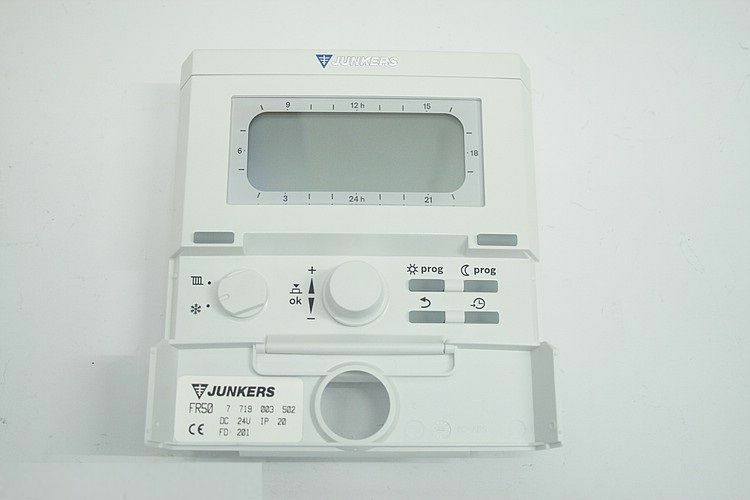 My personal product choice was my home thermostat made by Junkers, which controls my flat's heater. This system allows me to decide whenever I want my flat to be heated or not, however, many interactions and in particular the configuration are quite confusing. Before taking part of this course, I barely understood how it works and didn't know how set it up. I was rather pressing every button until the temperature in my flat became at some point convenient. Finally, I ended up changing blindly the configuration every day even though the purpose of the thermostat itself is to handle the heating for me independently once configured. The off mode: The off mode is actually an anti-freeze mode that heats only when the room temperature goes under 5°c. It is activated when the circular switch is oriented on the icon. For any user having few knowledge about heating system, it would take a while until realizing that this symbol represents the thermostat's "off" state. that in the night phase it cannot be heated at higher temperature than in the day phase. that the day phase can be configured to heat during the night and the night phase during the day. that the text shown when configuring the day phase is "heat" when in the night phase it is "save". Why save if it is still heating? To let the heating program run, the circular switch needs to be oriented on the . It is important that the "auto" text appears on the screen. To toggle the "auto" text, the auto button has to be pressed. The manual mode: This mode lets the user override the temperature of the actual heating phase. To do so, the auto button hast to be pressed until it disappears from the screen. Then, by rotating the central knob the user can set the wished temperature. Because you can easily miss the information, it happens often to heat for many days without a break which is not really economic. 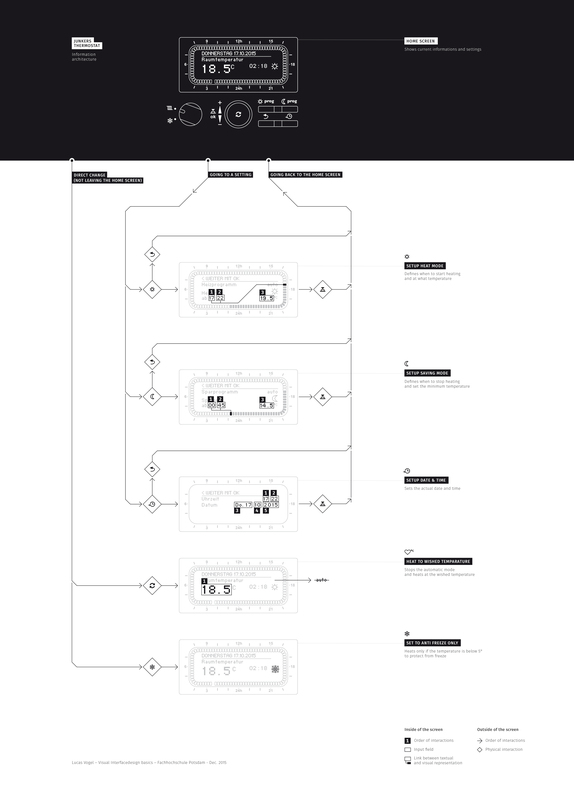 As a first investigation process, before ever improving the design of the product, the whole information architecture had to be presented in a visual way. Doing so, I made sure that the product was understood, that all its options were listed and distinguished. In the case of my thermostat, I opted to show the home screen as a base as it is there where all interactions begin. Starting from the home, I showed where any interaction leaded. Most of them bring the user to another screen and finally lead back to the home screen, when the setup is done. I chose to represent paths that can be visually followed and to indicate with symbols where interaction happens physically. On the multiple screens, I also labeled the different actions inputs that should be modified in a specific order. The style of the visual elements were intentionally inspired by the original aspect of the product in order to remain consistent. Doing so, I aim to make clear that no improvements to the original design were made and that the poster's intention is exclusively to make the status quo understandable. 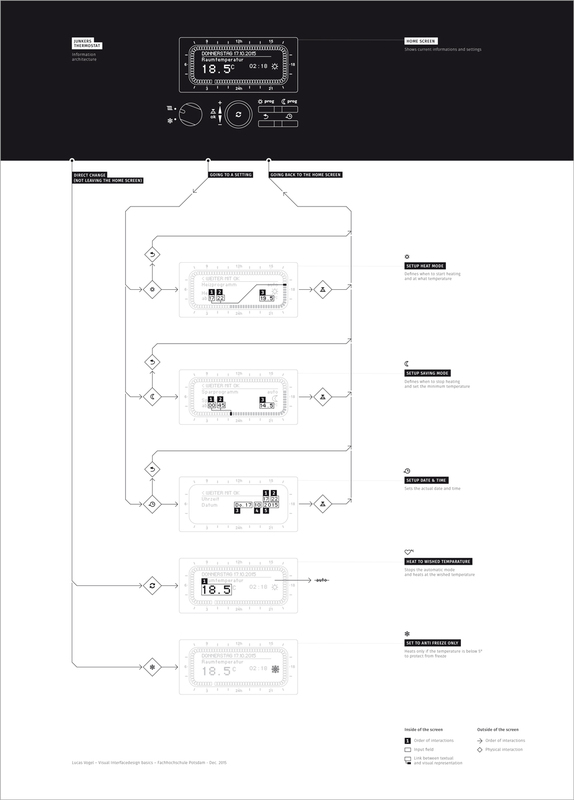 The poster then helped to better realize the weaknesses and strengths of the product, in term of interface- and interaction- design. The second iteration of the project was about offering a redesign improving the original interface. Even if I was aware of the product's strengths and weaknesses so far I still wasn't sure if improving the interface, iconography and vulnerabilities would be enough to make it as I wished it would be. 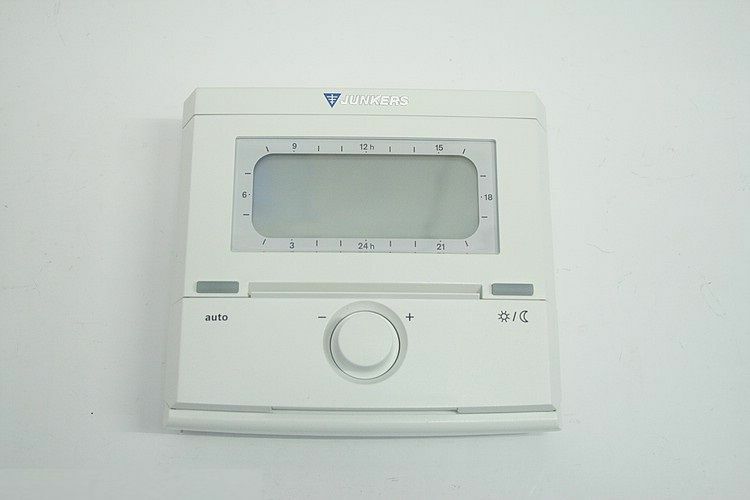 Instead of keeping the same interface and making it more understandable or beautifully designed, I choose to imagine an alternative to this thermostat which would fulfill my expectations. Additionally to the simple control that my thermostat gives me, I wanted it to be more flexible and to adapt better to my lifestyle. What if I go on vacation? An what it I want every Sunday to be more cozy at my place? That's why I came to the idea to make a smart-phone application called H°me intended for planing and organizing time spans in which you wish to heat your home. Nowadays, few are the ones which do not carry a smart-phone or a tablet with them on a daily basis. These devices became powerful tools that overcame many physical limits. The time has long become for old and complex home-heating systems to be replaced by a simple and dynamic application, that can be used anytime and anywhere. 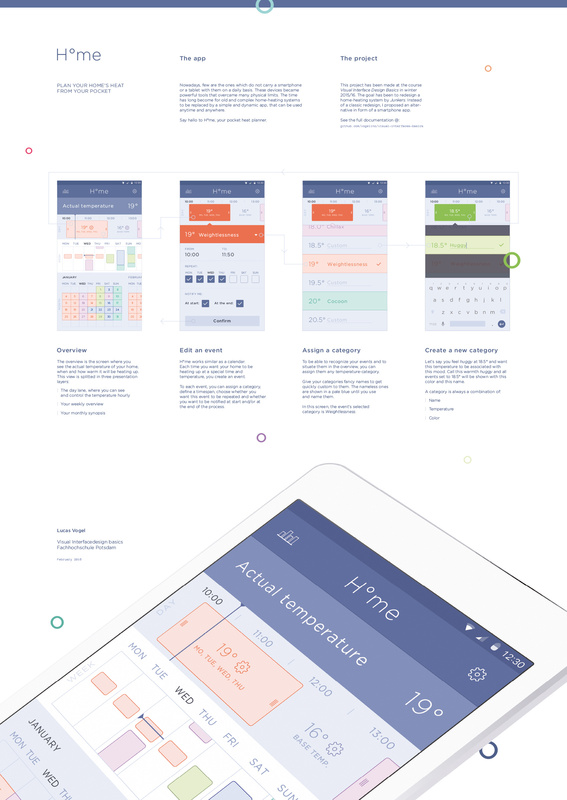 Say hallo to H°me, your pocket heat planner. H°me works similar as a calendar. Each time you want your home to be heating up at a special time and temperature, you create an event. To each event, you can assign a category, define a timespan, choose whether you want this event to be repeated and whether you want to be notified at start and/or at the end of the process. To be able to recognize your events and to situate them in the overview, you can assign them any temperature-category. Give your categories fancy names to get quickly custom to them. The nameless ones are shown in a pale blue until you use and name them. In this screen, the event‘s selected category is Weightlessness. 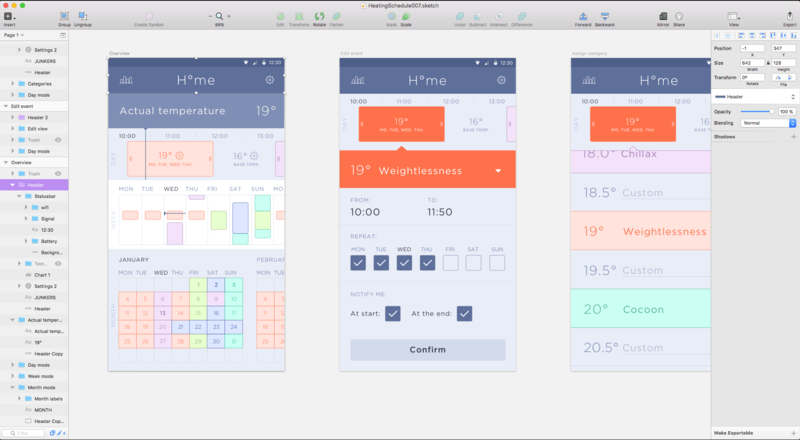 I created the screens with sketch, a tool for designing interfaces. I based my format on the dimensions of an iPhone 5s as a reference and aimed to make it feel natural and intuitive, regardless of IOS or android users. I made my best to make the UI elements look sharp at the @1x size, to make a balanced use of white space (particularly challenging for the overview, which displays many elements). The UX should be easy, intuitive and enjoyable. The use of only a few screens should avoid unnecessary interactions. When a user fully configures his heating plan for the first time, he's expected to open the application only for small modifications which should be achievable quickly and easily. As I did not have the time and because I am not experienced with working prototypes, I couldn't achieve to make one yet. Though, I planned to create one soon enough. If you wish to know when I'll be done, ⭐️ this project. To present the redesign, I created a A1 poster that displays the views and explains the different application's views and functionalities. This poster was presented at the end of the course, along with the posters of other students. This project remains under a WTFPL license which means that you can do whatever the F*** you like with all documents and files of this repository. If you make a project like this one, or used the files of this project for another one I would be please to have a look. Notify me @vogelino !